“Aerophobia: the fear of flying” is estimated to affect 6.5 percent of the population according to the National Institute of Mental Health. Travel delays, plane crashes and the threat of terrorism after 911 can make the fear of flying worse for individuals, so the reluctance to fly may be a more “rational” response. In my case, the fear of flying was not a “rational” response. I suffered debilitating terror around flying and because of it, I didn’t travel on an airplane for twenty years. Martin Seif, who is a clinical psychologist specializing in anxiety disorders, says, “the most common person who’s afraid of flying is someone who’s claustrophobic.” Although this brings me comfort knowing I am “common,” at the time it was very confusing to me as I flew all over the country when I was a young adult and didn’t have any claustrophobia. What is claustrophobia? Merriam-Webster’s definition is an “abnormal dread of being in closed or narrow spaces.” Bingo! My skin crawled just thinking about being in an enclosed tin can for any number of hours. At one time, I panicked just thinking about it, but the trade-off with not being capable to travel to far-off regions was more incapacitated than not being able to get on a plane. If you need to fly and suffer from claustrophobia there are ways to overcome your fears and help with getting past anxiety. Some coping techniques to help prepare you before and during your flight that can help ease the anticipation. A therapist can teach you coping strategies to use when you are on the plane. Hypnotherapy is an effective way to turn your negative feelings away from panic, and divert your attention to happier thoughts, and visualize a serene scene. Use a mantra to center on more calming thoughts such as repeating “I am safe” this can help distract from the unpleasant symptoms from anxiety. Many people with anxiety have someone with whom they feel comfortable and safe with. Having a trusted friend or family member travel with you can be a great source of comfort when flying. If you have a panic attack, he or she may be able to help talk you down, or just having that person there is all that is needed to feel safe. If possible, choose your flight during times that aren’t common among business travelers which make those flights extremely crowded. Research the route to see what days and times are less popular and book a nonstop flight or connect in a smaller city. More importantly, choose your seat to best fit your needs. Many people with claustrophobia prefer to sit in an exit row, which provides additional leg room or an aisle seat permits you to easily move around the plane. A window seat allows you to gaze outside and enjoy the view. It can give you the distraction away from the crowded plane. 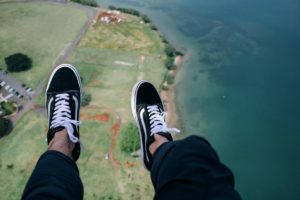 One of the best way to overcome the fear of flying is exposure, whether that’s through virtual reality, a flight simulation, or actually flying. Avoidance keeps your phobia alive and intense. so Some cities offer classes for individuals who are afraid to fly by using a flight simulator that looks like a plane to help expose the feel of flying. Even though this method could help, you are not in the air. The method that worked best for me was the real thing. Flying. Book a short flight, about an hour or two to expose yourself to the feeling of being inside the plane, that way you can if needed practice managing the anxiety and work your way to a person who can go anywhere.